Learn about the latest equipment available, from cameras to printers, and how to use that equipment to compose better pictures, edit images, and include photos with your e-mail. Perfect for the beginning digital photographer, this easy-to-follow format helps anyone take the best picture possible. About the Author David D. Busch has been demystifying computers, digital imaging, and photography since the early 1980s with nearly 70 books and 2500 magazine articles for dozens of leading computer and photographic magazines, including Macworld, Computer Shopper, The Rangefinder, and The Professional Photographer. 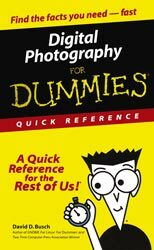 Digital Photography For Dummies Quick Reference is his second book in the For Dummies series. Before he was seduced by the dark side of technology in 1977, Busch operated his own photo studio and had his work published on the covers of magazines and in both print and television advertising. He says his chief motivation in writing books these days is to create venues for publishing photos of his wife and four children. The Big Picture: Digital Photography. PART I: Deciding on a Digital Camera. PART II: Getting the Most from Your Lens. PART III: Choosing and Using Storage. PART IV: Lighting It Just Right. PART V: Composing Great Pictures. PART VI: Taking Various Kinds of Photographs. PART VIII: Getting Creative with Your Photos.